Rize Inc. emerged from stealth almost two years ago, unveiling an office-ready 3D printer with unique capabilities including minimal post-processing and the ability to print ink directly on printed parts. Now, Rize has unveiled the first practical applications of this inkwriting technology with what it calls Digitally Augmented Parts, which can utilize embedded ink patterns for augmented reality and other Industrial 4.0 technologies. Rize’s Augmented Polymer Deposition (APD) combines thermoplastic extrusion with inkjet printing to bring elements of voxel control to the 3D printing process. This includes printing a special interface material in between the printed object and its support structures, allowing for quick support removal. It also means that Rize can integrate traditional 2D printing inks into the process, so that images, text and symbols can be written onto the surface of parts. 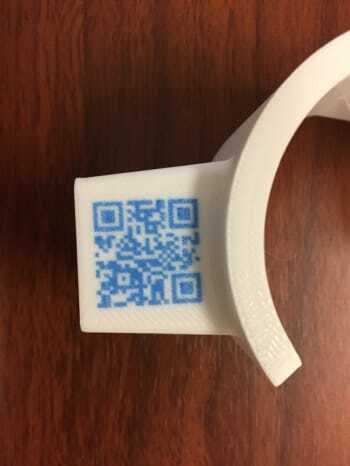 Rize’s Digitally Augmented Parts utilize this latter capability to embed markers, such as QR codes, onto parts that can provide traceability through the manufacturing process and lifecycle of the parts. A smartphone app can then be used to scan the code and call up the information. Rize is emphasizing the use of the 3MF file format, which is meant to include information beyond the simple geometry of a 3D file, for such an application. In addition to details like color, 3MF can carry data related to a component’s origin. As we learned from our earlier interview with Rize in 2016, APD, in some respects, mirrors HP’s Multi Jet Fusion (MJF), in that the use of inkjetting enables the introduction of functional inks. HP actually demonstrated a similar application for MJF, showing how an AR app can be used to scan a 3D-printed part with an embedded QR code. Similar to some of the future capabilities that HP is promising with its MJF, Rize could also one day release inks that are electrically conductive, thermo-insulating or thermo-conducting. Though HP has substantial size and capital behind it, it may be that Rize, which has the flexibility of a small startup, will release these products sooner. Kalambi mentioned in our interview with him that the company is working on its future printers. Potential customers may have their fingers crossed that these new materials are in the works as well. To learn more, visit the Rize website.